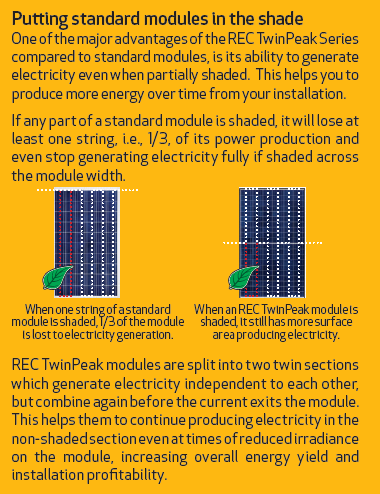 The new technological advancements in the Twinpeaks modules provide more power output per square foot than the standard 60-cell solar panels and the latest REC 290TP2 TwinPeaks2 modules are a further development in this series. Greater panel efficiency, even in shadier conditions and smaller areas, allows for more electricity generation capacity and maximum use of the available space. 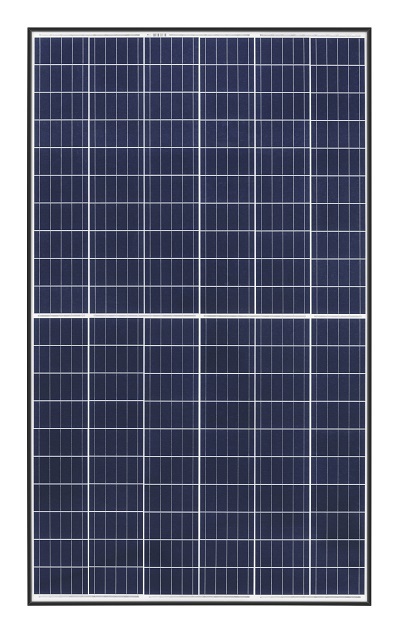 Based on an innovative design that provides more power output per square meter, the new REC TwinPeak2 solar panel features 190 watts 120 half-cut multicrystalline cells, four bus bars, passivated emitter rear cell (PERC) technology, and a split junction box. 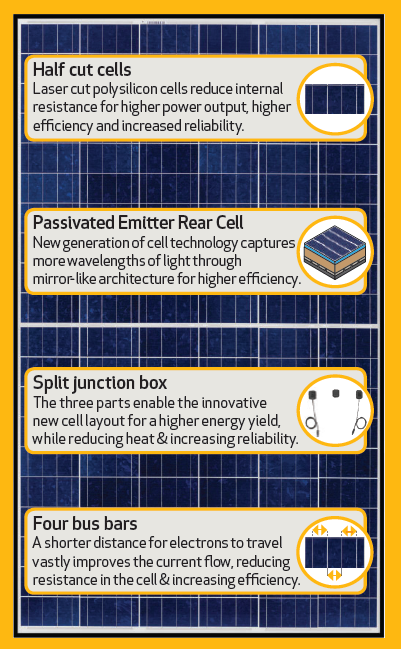 Together, these technologies enhance power output by over 12 watts per panel. Like all REC products, the REC TwinPeak2 Series are 100% free from potential induced degradation (PID), avoiding power losses even in the harshest conditions and environments in terms of high temperatures and humidity. Splitting the junction box into three separate units enables the ground-breaking new layout of the REC TwinPeak Series, while also reducing heat build-up and bolstering panel reliability. Furthermore, the half-cut cells — which are manufactured by laser cutting standard-sized cells in half — result in a reduction of resistive losses and a higher fill factor. The PERC architecture improves the light absorption of the cell, boosting overall performance, and the addition of a fourth bus bar increases the flow of current, improving efficiency and reliability.